If you are reading this, you are one of those interested to find out how to make the best of your MTGPQ experience. This post intends to help you navigate the various pitfalls which a newer player will face and give you a better idea of what to expect for your time and effort. Always bear in mind that your chances of victory will be influenced by a multitude of factors. These include your card collection, your planeswalker collection, your Colour Mastery tier, your opponents and RNGesus. The main factors you can control are your card and planeswalker collection, and your Colour Mastery tier. With that in mind, we will first cover the significance of the distinction between Standard and Legacy, followed by suggestions how to spend your in-game currencies, an overview on Colour Mastery, and what the ‘Wall’ is. Hopefully after reading through the next few sections, you will understand why the aforementioned points are pitfalls and how to avoid them. That will then be followed by looking at the value of spending money in this game and some useful statistics on card drop rates to round off the general areas one should know about in MTGPQ. IIn MTGPQ, there are Standard and Legacy events. Standard events are restricted to cards from Origins and the sets from the two newest MTG years. The MTG year starts from the Fall release, so when the next Fall set is released, the oldest four sets will rotate out of Standard. For example, the Fall sets of the current two years in Standard rotation are Ixalan and Guilds of Ravnica. 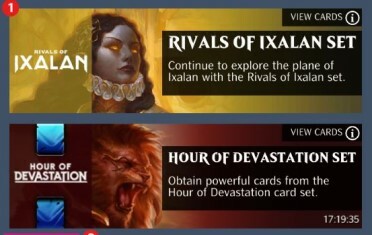 When the Fall set of 2019 is released in MtGPQ, Ixalan and the other three sets in its year (Rivals of Ixalan, Dominaria, Core 2019) will rotate altogether out of Standard. When you tap the info button for each event, Standard events will have a display circling the sets which are valid. Legacy events will not. Also, Legacy events and card packs will have a blue banner on the top left. Note that all cards from Free Boosters will be from Standard sets. There are 4 primary currencies in MTGPQ. Runes (the silver stuff): These are used for levelling your planeswalkers. They are also used for unlocking an additional deck slot when your planeswalker is at level 60. Crystals (the gold stuff): This is your primary currency for obtaining new cards. Crystals are used for purchasing most card packs, for purchasing planeswalkers and as the entry fee for Trial of the Planes and Rising Tensions. Deck slots can also be purchased with Crystals. Once in a blue moon there may be special offers which can be purchased using Crystals. Jewels (the pink stuff): This is the currency designated by the developers for end-game players to have an easier path to pursue the Mythics and Masterpieces available in-game. They are used mainly for purchasing packs from the Masterpiece Collection although there are occasionally special offers available for purchase in Jewels. Orbs (shown on the Booster Crafting page): This is the currency that enables everyone to eventually work towards a complete collection. Whenever you open a duplicate card, they are automatically converted into Orbs and Runes. What should I spend on? 1. If you don’t have a decent collection of cards to work with, having strong planeswalkers will not help you all that much. So at the very beginning, focus on procuring cards first. Also coalition events usually have secondary objectives which are better achieved by cards from the latest set. Coupled with the power creep in the game, it is typically better to be purchasing cards from the latest set (or two). 2a. Most events have nodes which require planeswalkers of certain colours. If you don’t have a planeswalker of the required colour you can’t participate, depriving you of the chance to earn progression and ranking rewards. Although the Origins planeswalkers are rather weak overall, their 50 Crystal cost can be recouped rather quickly through the additional rewards you will earn from being able to participate more in events. The caveat is that you should at least have decent cards in the colour of the planeswalker which you are getting as planeswalkers can only use Colourless cards plus cards of their own colour(s). 2b. Other mono-colour planeswalkers cost 295 Crystals whereas dual-colour planeswalkers cost 650 Crystals. Colourless and tri-colour planeswalkers cost 850 Crystals. Either of which will take a long time for a new player to accumulate and will still only allow you to participate in one node as you can’t assign a single planeswalker to multiple nodes. If however, you have plenty of Crystals (whether through hoarding or spending money) you can consider to skip straight to better planeswalkers depending on which of the better ones are available in the Vault. Not all 295 Crystal or 650 Crystal planeswalkers are worth spending on. Safe picks dual-colour picks are Kiora, Saheeli Rai and Teferi. Other dual-colour picks to consider are Nahiri, Huatli (Radiant Champion) and Samut. Fairly safe mono-colour picks are Elspeth and Koth of the Hammer. 3. When you have a decent card collection and planeswalkers to contest in all colours, then options start opening up for you. You may choose to get stronger planeswalkers, or cards from other sets which you have less of, or even choose to save up in preparation of upcoming planeswalkers or the next expansion. On Runes, levelling up your planeswalkers will unlock abilities and improve stats. The trade-off is that matchmaking for PvP is based on planeswalker level so you are likely to face more challenging opponents. There is no single best rule on how to level your planeswalkers, but the general consensus is that there is no rush to level them to the max level of 60. Colour Mastery is both a boon and a trap. Its intention was to differentiate players of different skill levels to allow players to compete with others of similar levels by splitting everyone into 4 tiers: Bronze, Silver, Gold and Platinum. You earn Colour Mastery points by using a card repeatedly in your decks, with Common / Uncommon / Rare / Mythic / Masterpiece giving 2 / 4 / 8 / 16 / 16 Mastery points when mastered to the colour(s) of the card (or half the points to all colours if Colourless) respectively. However, the implementation was not done in the best of ways. Consequently, what happens is that players are lured by the prospect of greater rewards in higher tiers and some choose to intentionally master cards to reach a higher tier only to find that they cannot compete as their card collection is way weaker than what is needed to compete at that tier. And the biggest problem is that there is no way to drop back down to a lower tier, so these players are stuck having to fight against opponents with decks that outclass theirs completely. This can be the deathblow that kills any fun you might have in MTGPQ (at least for quite a long while) so avoid making this mistake. Another consequence of this system is that it somewhat discourages experimentation with cards as mastering too many cards will push you more quickly towards a higher tier. This is unfortunate but the only option at the moment is to try to avoid mastering bad cards and to consciously only master the better cards you currently have, especially when your collection is small and you are still gaining new cards at a decent rate. At some point (primarily if you are a Free-to-Play player) you will find that you are not getting that many new cards but your collection still isn’t good enough to compete for top ranking within your tier. This is in part due to MTGPQ not having a surge of packs for newer players like many of the other Gacha games do, and also in part due to the sheer number of cards that are available in the game (Standard stands at 1,123 cards as of the end of January 2019, Legacy has 2,353). Don’t be too worried about this. At this point you would hopefully already be in a coalition with people whom you can identify with or share similar goals with. Take this time to better learn the intricacies of the game rather than feeling like you have to rush to process new cards all the time. At some point, you will break through the wall and maybe you will find that you are then ready to take on greater challenges in MTGPQ. Also take heart that the introduction of Booster Crafting and Orbs means that your duplicate cards will now gradually contribute to you getting to open a new card for your collection. The in-depth details of the system and the conversion rates can be found here. Do I need to spend money on this game? Let’s work our way down from the extremes. Is this game Pay-to-Win? The short answer is no. The game gives a decent amount of rewards if you can complete the various events each day. Being in a coalition will also help you improve more quickly through the advice and the additional coalition rewards you receive. This will allow you to build up your collection to be able to perform better in future events. Will you be able to be instantly or quickly competitive? No. As previously mentioned, your card and planeswalker collection play important roles in determining how competitive you can be. Your desired planeswalker can take weeks to cycle into the Vault for purchase. You may not get a particular card you want from a set regardless of the number of packs you open from the set. Instead you may only be able to craft it with Orbs much further down the road. Even with Booster Crafting, there is still an element of luck involved if there are other cards in the crafting pool of the card which you want. Luck is a factor which will persist throughout your time with the game. There will also be luck involved in the card draw, board generation and opponents faced for each match. This is an important aspect of MTGPQ that one has to be comfortable with. Will spending money help you be competitive more quickly? Yes of course. You need cards and planeswalkers to compete. 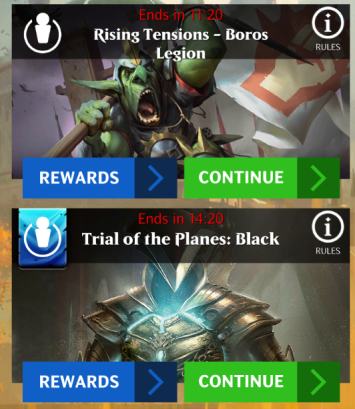 Kickstarting your collection by being able to open more packs or having strong planeswalkers from the onset will help you to earn better rewards more quickly. This in turn will speed up your collection rate, which helps you build a better position. MTGPQ sells bundles for both new planeswalkers and exclusive Mythics. The exclusive Mythics sold for cash will stay exclusive to paying players until the next set is released though these can vary drastically in usefulness. Some exclusive Mythics can be a must-buy whereas others can be total duds. The new planeswalkers out for cash will only be released for Crystals in the Vault at least three weeks later, giving those who pay for the planeswalker an exclusive period to utilise a planeswalker whose abilities are typically built to synergise with the latest card set and help greatly in hitting the objectives in coalition events. However, remember that planeswalkers will eventually be available in the Vault for Crystals. Managing your expectations on card drops will greatly influence your enjoyment of this game. The drop rates for regular pack types, ie. those which come in the 5-card pack, Super Pack (5x3) and Premium Pack (5x5) configuration, are approximately 55% / 39% / 5% / 1.4% / 0.1% per card for Common / Uncommon / Rare / Mythic / Masterpiece. Premium Packs are the best option of the three for procuring cards as they come with an additional guaranteed Rare. There is currently no pity timer in the game. As such, it's important to understand that there will be times where one goes on a streak of good pulls with Rares, Mythics and even the occasional Masterpiece popping up but there will also be streaks where all you see is Common and Uncommon cards. You have a ~70% chance of getting 0 Mythics in a Premium Pack. That means only 3 in 10 Premium Packs will yield any Mythic(s) on average. You have a ~28% chance of getting 0 Rares in a Premium Pack (not counting the guaranteed Rare). That means 1 in 4 Premium Packs will not yield any extra Rare card(s) on average. If you have 24 out of 40 Rares in a set, that gives you a 60% chance for a duplicate when you get a Rare drop. If you have 10 out of 40 Rares in a set, that is still a 25% chance for a duplicate when you get a Rare drop. Use this information to help you decide whether to open another Premium Pack or to save up for an incoming planeswalker or even just to save for a rainy day. If you have a high percentage of the cards in a set, you are liable to getting mostly duplicates in your next Premium Pack. At the stage where you have all the Commons and Uncommons from a set with a notable number of Rares, a Premium Pack may only yield 0 or 1 new cards on average. Although these duplicate cards still yield you Orbs, one should consider whether their collection is in a good enough position that they can start saving Crystals for the release of the next set. An additional advantage of saving for the next set is that any duplicate of the new set opened within the first month of its release are worth 50% more Orbs than usual. There have recently been constant changes to the event timetable. So please check the MtGPQ Sneak Peek thread for the latest official information. The advice in this guide should provide you with a strong foundation for MTGPQ. For more advanced discussions, I recommend to seek out an active coalition and/or the MTGPQ communities available (primarily the official forums, Reddit, Discord and Slack). May you enjoy your time playing MTGPQ! @span_argoman thank you so much for putting this all together! It turned out even better than I had imagined! It is incredibly useful to have such easily-linkae detailed guides to share with our new players. @Sarahschmara It's a little wordy when reading on mobile haha, but yeah the hope is that it'll help newer players to come. This article obviously has a lot of great info in it, but I think it might actually have too much for its intended audience. It starts off being very much about the first few weeks of play, how to get started, and some common setbacks to avoid, but I feel like it goes into too much depth with things like customer support policies on Mythic+ packs (how many people in their first few weeks are not only pulling these, but pulling them often enough to need to swap duplicates?) and other more high-end player concerns. I could be off base here, of course, but I think a lot of this could be cut by about half the verbiage -- and I am a longwinded nerd myself. Strip down to the big bullet points, and maybe link out to other discussions for the reasoning and fine details where appropriate. I also think it could be made more readable with a little bit of text formatting -- italicizing or bolding key concepts, and maybe breaking a couple more sections down to list format. @Dayv it's really good to get feedback from someone outside the game. The goalposts move pretty quickly as one levels in MTGPQ so the FAQ ramps up to compensate for that. Hey @Dayv your feedback and criticism is very much appreciated! By posting this on a public forum, I am already indirectly soliciting for feedback. I've formatted that bit about Mythic+ Packs to make it clearer that the particular paragraph applies more for paying players rather than the average free-to-play player. It is also relevant for advanced players, but the intention of inserting it into this guide is really more to alert any big spenders on what options they have as redress for a Mythic+ Pack duplicate. It is very much possible for a big spender to buy enough Special Offers to have Jewels for multiple Mythic+ Packs and I felt it was important to have stuff in the article for paying players too. I do intend to work on another guide that focuses on Trial of the Planes and Jewel spending options so when that's (eventually) done, I will probably link to that guide instead of having that spoiler segment after the description of Jewels. And hopefully other detailed articles will appear on the subforum in due time. Other than that aspect though, the bulk of the rest of the guide provides background for the reader to better understand why certain recommendations were made in the guide. If MTGPQ had a functional wiki (we don't) or if there were adequate explanation of the various concepts in-game, it would have been better to link to the relevant wiki pages or point out where in the game the concept is explained. As it is, I felt that this was the best way to contain the information within the constraints of a forum post and what resources we currently have for MTGPQ. Another issue why this article is so long is because the game honestly has quite a few areas which new players have to be careful about. It doesn't reflect too well on the overall game design but at least the gameplay is engaging and that's why we are putting out articles like this to help people get to the fun stuff. I get your point on readability though, that is always important to keep an eye on. *pun intended* I have tried to add some more formatting into the guide to make it easier on the eyes. There were some formatting changes that I didn't catch before which I have also fixed up now. If there are any specific sections which you feel can be changed into list format though, do let me know and I'll look into it again. Thanks for the information, but now I've actually played a few weeks I have a couple concerns. Firstly, if you want the related pack there is no downside to entering Trial of the Planes; you only need one win to get the pack(easy for anyone when the first node gives several attempts with no handicap) and entry(60 Crystal) is cheaper than buying single packs in the Vault(80 Crystal). Honestly not hard to win at least some Jewels and I've managed the max amount a few times. The only reason not to do Trials is if you are saving Crystals for something else. Otherwise it's a great alternative when you're new because you need some cards to get competitive but don't want to waste Crystal on inefficient purchases. You describe this same logistic in the link in your sig so I'm not sure why you're giving advice that contradicts it here. New players should typically get the most out of Trials. Personally I haven't done the Trials in a while because I was saving to buy Sarkhan but that's a decision I made once I had some decent cards. Which leads me to my second point; not all Events prevent a single Planeswalker being used on multiple Nodes. Edit: I previously had an event that claimed to be Locked which wasn't but you're right about that. Multi-colour has pros and cons, sure, but the following is still generally true. 3 Colour PW's are both powerful and versatile, so while saving for them takes patience I think it's a more effective investment overall. The 3 available mono PW's right now in the Vault are arguably the best for their colour(Eslpeth, Koth and Vivien), but still not as good as Sarkhan, Nicol Bolas or some of the two colour PW's. Anyway, a lot of this is subjective as people have preferences for certain PW's, just saying that covering multiple Nodes is only for some events and multi-colour also helps with Objectives. There are times where I literally can't cover a certain objective with a certain colour. It helps to cover your weak spot with the big 3 colour PW where a stronger mono-colour isn't going to change the problem. Regardless of these concerns(which are intended to be constructive and to help any new players but take them how you will) I appreciate the effort you put in and pointing out that Colour Mastery is a one way street is crucial enough for that alone to merit this being stickied. The only other thing is I've either skipped the wall or it hasn't come yet. Maybe when I'm in Gold League, although Silver seems easy most of the time. Some strong enemies, sure, but half the time their decks look like they were made using Auto-fill. Hey @Gargoyle, thanks for your feedback on the guide! You're right about there being no reason not to do Trial of the Planes (ToTP) if you aren't saving for anything else. But we are always saving for something or another in this game, whether it is for Premium Packs, or a future planeswalker to be released in the Vault for Crystals. And hence there is always an opportunity cost to taking part in TotP. The single pack is not a valid unit for comparison since no one should be buying those. We compare against the other best option for procuring cards, which is the Premium Pack at 320 Crystals. For that 20 more Crystals compared to playing a week of TotP, you get a guaranteed Rare instead of potentially a few more Jewels and Runes. And to a new player, that guaranteed Rare is worth more to their collection than the measly few Jewels one will get from TotP. As a Fresh player, a chance to loot Rares matters still. So we look at the Rare+ Pack for which 50 Jewels is 41.7%. Those proportions aren't exactly close to the guaranteed Rare from the Premium Pack. 50 Jewels is also 12.5% of a Mythic+ Pack which put another way is sacrificing 8 Rare draws for a single Mythic/Masterpiece. That translates to a two-month wait to accumulate enough Jewels for a Mythic+ pack solely from TotP, in which time additional new Rares could have helped to round out a player’s collection and possibly improve their Event performances for greater rewards. For a Fresh player in Bronze, the numbers become 25% of a Rare+ Pack or 7.5% of a Mythic+ Pack. It’s a sacrifice of 13 Rare draws for a single Mythic/Masterpiece which is a three-month wait to accumulate enough Jewels for a Mythic+ pack solely from TotP. So the effect is magnified. As for the Runes, they are actually negligible because the player has to win 40 matches of TotP to obtain all the Progression rewards for 5 TotP events. With 100 Runes per win on top of the Progression rewards, that's 11,500 Runes for the Bronze player and 10,250 Runes for the Silver player. If the player instead chose to play and win 40 matches in Story Mode - Heroic Encounters, they would earn, at 250 Runes per win, 10,000 Runes at no risk. That additional 1,500/250 Runes from picking TotP hardly matters. Hence TotP doesn’t look too good for a Fresh player unless they are desperate to earn more Jewels for some reason. The amount of time taken to be able to amass enough Jewels from TotP to open a Mythic just does not warrant spending all that extra time playing TotP on top of the delayed opening of a new card (the Mythic vs multiple Rares). Good Rares will be as important to a newer player in building up their collection as a decent or good Mythic (not to mention the chance of pulling a terrible Mythic from the Jewel packs). As for the Rare+ packs, the exchange rate is much worse when you compare the guaranteed Rare to a fraction of a Rare+ pack. One essentially would be gambling on the Rare+ pack yielding a Mythic or Masterpiece to make their efforts worth it. Which makes it simply that, a gamble instead of a good option. So no, newer players most definitely do not get the most out of TotP. It is the Platinum players who do, particularly because of the 30 Crystal rebate from the final reward tier in Platinum TotP, and especially those who have collected a significant percentage of the set from opening Premium Packs already. The best option for newer players is still to save up for Premium Packs and to open them instead of taking part in TotP. On the other hand, Rising Tensions is great for all players and everyone who's playing the game should play that every time. That's a good point! Nowadays we're actually getting more Crystals per week than before, so the wait to save up for a dual-colour or tri-colour planeswalker is less than it used to be. So it's perfectly fine to skip to saving for the top-tier planeswalkers after getting the Origins 5 in order to be able to participate fully in all events. Mono-colour planeswalkers perhaps can just be skipped as long as there is a worthy multi-colour planeswalker coming up in the Vault. Also the need for multiple planeswalkers is primarily relevant to PvP events. However, the last PvP event Oktagon released with planeswalkers being tied to nodes was The Dragon War which was from the M19 set (released slightly over half a year ago). As such, the proportion of events which require multiple planeswalkers has actually dropped noticeably which is why you don't face that issue as much. And I guess that means this guide requires a little updating. And yes, very much agreed that Colour Mastery is a deadly trap but hopefully their new plans with using the new player level for matchmaking and sorting will be implemented soon (and properly). Nonetheless, it is good to hear that you didn't have to face the wall. I consider that a positive development for the new player experience. Know that if I disagree with your points, it is with the statements and not at all directed personally. Feel free to voice out your disagreements or any other points you may wish to make. Hmm, so I may not have read all of the averages and probabilities from that article beforehand(skimmed it, tbh), ahaha... Excuse the bold sections, lol. Still, while Elite Packs may not have a perfect ratio on paper I wouldn't undervalue the significance of Mythics. Just a shame Elite packs can fail. And I do admit that I've gotten far more Jewels from competitive events. First one I opened I got a solid Mythic(End-Raze Foreunners, nice with Nissa as below), but the one I opened yesterday was a Rare(Benthic Biomancer which is more niche and not great). That's recent though(they're Allegiance cards after all) so it doesn't disprove your point. Another thing with Trials is that sometimes you just don't have the time. Do everything else that you can for the day before even entering one; there's a fixed number of attempts per Node anyway so live your life before dropping Crystal on something that's too much of a time investment. I think I may have skipped the wall thanks to Selesnya and Lifelink Soldiers(especially helpful in campaign events with huge HP bosses); my Nissa and Gideon win rates took off long before I got Chandra, Jace or Lilianna performing half as well. That was a bit of luck due to pulling Emmara, granted, but Hazda Marshall is a fine token generator with the right setup also. This was helped greatly by Chords of Calling, so the Exclusive Cards from Rising Tensions do help, yeah. Chord was a good tool to begin with but scaled as I got some better targets. Some Exclusives less so but this next bunch look strong on average. Circu, Dimir Lobotomist was what made Jace viable for me, also; I don't have the infamous Sphinx's Tutelage so he gave me access to the spell-lock strategy which has come in handy sometimes. Patience required, lol. The Booster Crafting benefits once they cycle through once are handy too. I'm using them to pick up Legacy cards so I can access some older card effects for Objectives in certain events. And yes, I was very deliberate at finding a competitive Coalition. This is key! Especially seeing as your Coalition points don't transfer, find a good one sooner rather than later, any new players. Your Coalition will benefit from it and therefore you will too. Anyway, I'm glad to have Sarkhan. I should put some more XP into him, actually. Disclaimer to anyone considering buying him that he needs to hit a higher level to function well. Stockpile your XP, which goes for any purchased PW's as the original 5 scale poorly with the possible exception of Lilliana. Just trying things atm; so many options. The Gruul Exclusive we just got is my focus right now; seeing how many Saprolings I can get before playing him. I guess at a certain level there will be more removal but I'm sure I'll Adapt thanks to Simic. Yeah, no doubt Mythics can be strong. But as we are both aware of, there is the chance to pull a useless Mythic from Elite Packs. The other more important point that you've brought up is that the bulk of one's Jewel income comes from other events aside from TotP. The additional guaranteed Rares pulled from Premium Packs (which you also gain access to earlier) together with the Mythics pulled from Elite Packs will help round out one's collection better than focusing only on Elite Packs (for a newer/Fresh player). So my advice to newer players is still this: The meagre increase from partaking in TotP is not worth the 60-Crystal entry fee nor the additional time required to complete it. Great points about the wall and thanks for sharing. As you've pointed out, the exclusive Mythics from RT bolster a newer player's collection significantly. Chord of Calling is going to be a solid card in Standard until it rotates out (or unless power creep gets even more ridiculous lol). Circu is good with a spell-heavy deck of which there are plenty of viable ones in either of its colours. As you get better cards, you might start to find Circu a little overcosted for what it does but it is a good addition early on. Depending on where you are in the game, I don't recommend crafting Legacy. Legacy events tend to be fairly low on rewards so the Orbs spent on crafting Legacy cards don't get a good return. Especially when you consider that the Legacy card you craft may only be relevant once a month. Also, you will gradually accumulate Legacy set packs from the various Legacy events simply through participation so I would strongly recommend you spend your Orbs on Standard cards instead. Generally it is good to craft Origins Mythics first to have a base of cards to build decks with. Origins still holds a decent number of cards which still see play. Additionally, Origins Premium Packs have terrible drop rates so the alternative method of pulling Origins cards isn't great. After crafting Origins, I'd say it would make sense to focus on the sets with (probably Mythic) cards you desire. Considering the number of GRN and RNA packs we get from RT, the next best Standard set to focus on is probably DOM. The importance of finding a coalition which suits your ambition definitely cannot be understated and I'm glad you have found a suitable one for yourself! Though, I must add that at this point cumulative coalition points don't matter at all. Eventually when they add seasonal rankings, it will start to matter. But for the purposes of earning more rewards, for now only the points earned in each coalition event matter. You're right that the Origins 5 planeswalkers don't scale very well. Fortunately there is no obligation to keep levelling your planeswalkers in this game. Also, do check https://mtgpq.info/planeswalker to see a planeswalker's stats at each level. You may find that certain planeswalkers are more suitable when you are low on Runes.